Designed to fit with other pieces of Adam-style armour, the Large Steel Adam Spaulders will complement your warrior ensemble while protecting your shoulders. The shoulder armour shows off a bright metal finish for a great look. Corrugated detailing along the rims provides a touch of classic style, as well. These steel spaulders are designed to allow excellent maneuverability, making them a serviceable addition to your LARP gear. 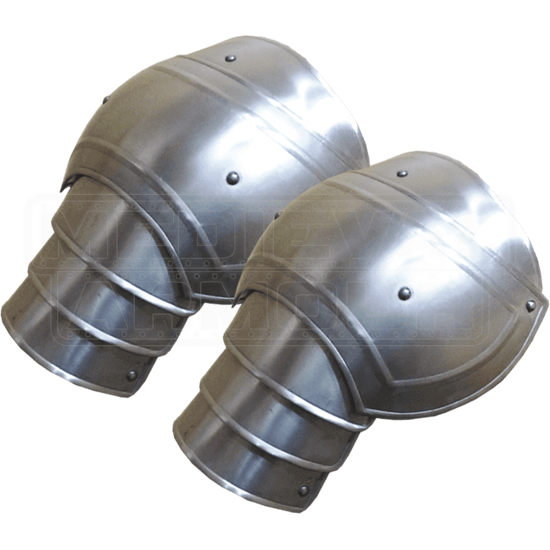 Consider wearing these metal spaulders with a gambeson or other arming wear for increased comfort. This Adam shoulder armour easily fits with the Steel Adam Gorget (MY100048). Please note that this item must be worn with a gorget.